It began with a man named John Avery Whittaker, his ice cream shop, his best friend Tom Riley and the many people of the small town of Odyssey. These first 13 episodes established the foundation of what this series has become. A glimpse into the lives of Odyssey's residents as they make their way through life's joy and hardship, keeping their eyes focused on the Lord Jesus Christ. 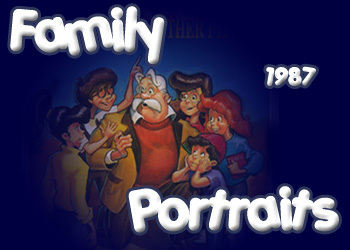 Before becoming "Adventures in Odyssey", the show took on the name "Family Portraits" and aired during Dr. Dobson's radio show. Before each episode (not all of which were the standard 30 minutes), Dr. Dobson would comment on the theme that would be presented. This role would later be performed by Odyssey's own announcer, Chris Anthony. Each of these episodes are unique in that each one is about a different family in Odyssey. These families are then never heard from again, with the exception of Whit's family. The only characters who are consistantly heard throughout are Whit and Tom. The show also had a more dramatic spin on it and focused more on its adult audience in these first 13 episodes. The response to them from Dr. Dobson's listeners was so positive that it prompted Focus on the Family to continue producing the show... and still going strong since 1988. Whit finds a young boy named Davey Morrison hiding in his garage. The boy's parents are getting separated and Whit realizes Davey needs some help coping with the pain. After a meeting his new neighbors, Whit reaches out to make their daughter feel welcome being the new kid. Chris Gottlieb, a man in a wheelchair, and Meg Stevens, a girl with a lot of questions, form an odd friendship when they help each other out. Budgie likes to exaggerate and his cousin Jamie feels he just can't trust him anymore. After an incredibly over-the-top tale, Whit helps both Jamie and Budgie deal with their differences and accept each other for who they are. Philip Callas gets angry during baseball practice and tells his younger brother Dean to go home. When Dean doesn't return home, the police get involved and try to track down the boy. While showing a family around a house that is up for sale, Whit tells a couple the story behind the house and why the former owners decided to move. After her father embarrasses her in front of a friend, Stacy refuses to speak to him. Her mother intervenes and tries to prove to her how much her father actually loves her. The Hudson family is having trouble with peer pressure. The daughter, Blair, decides not be friends with a guy who is not considered "in" and her father, Richard, puts down a co-worker to fit in. When the Hardwick's family frog dies, they have to learn to deal with the death of a loved one and face some important life changing decisions. Whit's grandson Monty comes to visit him but starts causing problems for Whit and the rest of the town when Monty starts acting out, feeling his grandfather has been treated him unfairly. In an effort to get attention, young Nicky does whatever he can to get his parents to stop thinking about their soon-to-be-born child.